Robert French ’48, a great friend of the Library and of Lawrence, died Saturday, July 13, 2014 at his home in Appleton. He was 90. Bob had a wide range of interests but his passion was Abraham Lincoln. Bob felt that “if we follow Lincoln’s footsteps, we’ll learn to live with different races not only in our own country but in the world…I think that’s my great interest in Lincoln.” He bought his first book on Lincoln in 1941, with money he received as a high school graduation gift. From there his collection grew to include thousands of books, pamphlets, government documents, art work, sculpture, a Lincoln autograph, and more. His excellent collection was made so by the fact that it was not collected willy-nilly, but strategically. Bob consulted many bibliographies including the Library of Congress Civil War bibliography, and systematically (with the help especially of the Abraham Lincoln Book Shop in Chicago) went about building his collection – then gave it to Lawrence. In 1992, Bob made the initial gift of his collection and in 1998 he gave a gift for the construction of the Lincoln Reading Room in the Library which was dedicated in 2000 in the memory of Bob’s mother. But that wasn’t the end of it. For the rest of his life, Bob was a regular visitor to the Library, coming in regularly to check on the collection, talk about it, and make additions to it. 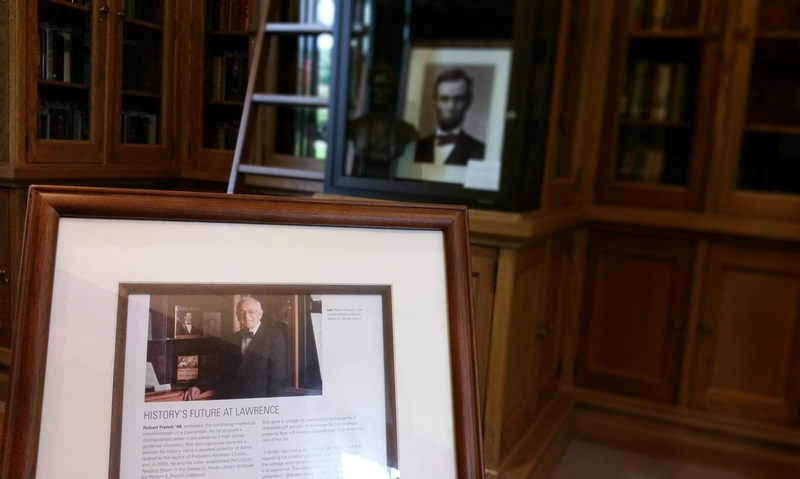 After the room was built, he continued to give current scholarship resulting in an impressive collection that includes significant works of contemporary Civil War and Lincoln scholarship as well as historical works. Of course, Bob was more than a donor and a visitor. He was a good friend to many at Lawrence and we’d look forward to hearing his voice on the phone or seeing his face in the doorway. Since Bob never owned a computer, once Lincoln scholarship began moving online, he would regularly call or stop by the reference desk to ask us to check “on the computer” for this book or that article. He was great storyteller and would always have stories about his time at Lawrence or a report from up at the lake or one of his many world travels. He was eager and very willing to talk with others about Lincoln and the Civil War in general. If you were interested, the discussions were lively and the information he imparted was remarkable. He will be missed by many at Lawrence. A memorial service will take place at 2 pm on Thursday, July 24, in the Nathan Marsh Pusey Room of the Warch Campus Center.